From now on, no animal picked up by Madrid’s animal control or living inside an over populated shelter will be killed. On March 13, 2015, Madrid became a no-kill city after the government signed in a new law making the euthanasia of strays or abandoned animals illegal. From now on, all pets in Madrid will have the right to enjoy their lives even if they have no homes or responsible owners. Caption: Nacho Paunero celebrating that Madrid became a no-kill city. 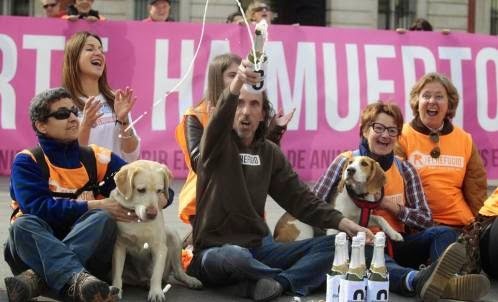 Local animal organization El Refugio started advocating for this law back in the summer of 2014 and they now celebrate their win. From now on, no animal picked up by animal control or living inside an over populated shelter would be killed. Any person who goes against the law and sacrifices an animal will be punished by the law. Congratulations Madrid! We hope many other cities across the world follow your lead. Did they stop bullfighting?? They’d better have. It’s a good thing ! But don’t forget abused Galgos ! Around 50,000 (yes fifty thousands) every year ! BRAVO!!!! NYC are YA listening???? Wow!! Much more evolved than here in the US. Awesome!! 1 down and many more to go !! Now, how about the bulls in the arena? Chicago Mayor’s Office – you can do this too!! This should be in every state!!!!!!!! What great news! Wish more would follow in their footsteps. Now, only if they’d quit bull fighting! That is completely archaic and just so sad! So then, do they just stop picking up stray animals? No city has shelter space for all the strays that live there. No-kill doesn’t solve an over-population problem. No kill only survives by getting other (public admission) facilities to do the killing for them. What about those that are not adoptable due to health or temperament issues? No kill believes ANY home is better than NO home. As a long time rescuer who has cleaned up more than one of those messes left behind by the Nathan Winograd crowd I can tell you that NO home is better than the WRONG home. Until we get working on the front end (spay /neuter, responsible ownership, support for owners struggling financially) no kill is just a name that allows organizations to pull donations and volunteers from low kill or public admission facilities that are on the front lines of rescue. Wonderful! Can the bulls be next please? Hooooray!!! Good news indeed and the world should celebrate and emulate this. Ok, when I walked the kennels at my local open admission shelter last week there were around 40 pits and pit mixes. I had room to pull one. The facility is already at capacity. Can you find me 40 SUITABLE pit homes in the next 3 or 4 days? When you say there is not pet overpopulation problem you are part of the PROBLEM! Of course there is an overpopulation problem and a problem finding enough responsible homes. Of the 23 million who got new pets last year how many of those were homes responsbile enough to commit to that pet for the next 10-15 years… NOT ENOUGH! Stop assuming any home is better than no home. 40% to 60% of dogs in shelters nationwide are pits or pit mixes. Do 40% to 60% of your 23 million homes want a pit? Are those homes / families responsible enough to own a large and powerful breed? NO KILL STEALS RESOURCES FROM REAL SHELTERS WHO ARE WORKING TOWARD REAL (AND REALISTIC) SOULTIONS! So admirable & so difficult, with stretched resources. Now if they could get bull fighting banned it would be another thing to rejoice! Since there is no money to care for the animals, they will “not” pick them up in the first place. Madrid will be overrun with stray dogs, then people will complain about it. So stupid and typical liberal thinking.all about feeling warm and fuzzy, and never about cause and effect. Julio Obeso Diaz muy bien! Wow! Wouldn’t this be wonderful,if we could accomplish this in the states! Bravo to those who fought for this ! Great news! More cities to go! Yay! Proud to hear this. FINALLY A CITY WITH BRAINS. I hope they have a great spay and neuter program as well. ADOPT, DON’T SHOP!!!! This is so amazing !!!!! I hope they spay and neuter or there will soon be more dogs than humans. Why would you make a comment about abortion here? Every woman has the right to choose, the right over her body, her health, her future, her life. A woman takes precedence over a fetus. There are millions of unwanted kids … how many will you adopt? Get your silly religious fairy tales out of here. There is no “god” or any of that nonsense. Mind your own business. ok… I want every person who celebrated this as a huge win, I want you all to provide a plan for what to do with all the extra dogs and cats that there will be. Don’t call me names and say I’m hard-hearted. etc. Ask any of my friends and family about exactly how sooky I am about dogs and cats. But I also can see clearly the consequences of this. I do NOT like the idea of putting down perfectly healthy dogs and cats. Not at all. But unless your city has unlimited funds to spend on stray dogs and cats? if it does, it must be the only city on earth that has. So come on, give us a plan on how to deal with the problem. How about the bulls? Let me know when they end that barbaric ritual and I’ll pat them on the back. It will be a challenge, but puppy mills can go away, and responsible neuter/spay must be a part of the plan. The fact that 4-5 million pets get killed in shelters every year tells me there is a pet overpopulation problem to the tune of 4-5 million. You don’t even seem to be aware of what your saying, but just want to assume that the 23 million households you mentioned can absorb the extra 4-5 million pets. Those household already have their pets though; they’re not looking anymore. What you actually saying is that their are 27-28 million pets that need home each year and only 23 million households looking for a new pet. More pets than homes equals a pet over population problem. There are ways to address this issue (spay/neuter programs, education, community support for low income pet owners, etc.) but bad math skills (and I guessing a fair amount of delusion) isn’t going to fix anything. Now when will they wake up and stop the horrific bull fighting???????????? Very nice, but what will they do instead? For one more time bravo Spain!!! Spain needs to stop the cruel bull fighting!! I don’t know how these people of Christian Faith can be so cruel !!! Wonderful news.. I wish the rest of the EU would follow… Like Romania??? Wonderful and I wish other places would do the same. This is great, but do they have resources allocated to take care of all these animals? Not trying to be negative, just curious. I hope other countries will also do this as well. With the world would follow this specifically the Indonesian government! If you cant feed em,dont breed em ! !